Merino Wool Socks are best for all-year round but mostly suitable for colder weather, hiking, camping, hunting, skiing, and work. A full cushion and unique blend of various fibers means your feet stay warm and comfortable in any weather. These are the socks you want to bring with you on any outdoor activities that you will want your feet dry, comfortable, and warm. Merino Wool is the best choice of sock for being on your feet most of the day. The inside of the sock is 100% soft long-staple Merino wool, the very best for comfort. There is a medium-density terry cushioning on the sole, a low density on the leg, and a high density protective cushioning on the back just above the heel. The arch is supported by spandex elastic, helping to ensure that the sock stays in place, a particular concern when worn with sandals. 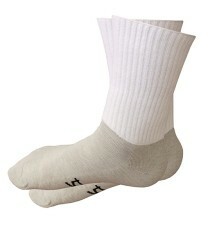 The outside of the sock is reinforced with nylon and polyester for performance, durability and quick dry. Super Merino Wool Socks keep your feet cozy, softer than regular socks. They help regulate body temperature, and control moisture preventing blisters and odor. Ideal for those suffering from circulatory issues. Superior Quality Wool Blend – Merino’s outstanding thermal regulation and moisture management for all seasons. Advanced Fit Technology – Conform to the shape of your fit for all-day comfort and performance. Enhanced Support – Arch and leg compression for all-day support. Seamless – Flat-knit toe seams and reinforced padding in the heel help reduce friction and prevent blisters when you’re logging lots of miles on the trail. Extra Cushioning – Reinforced toe and heel for maximum comfort. Multi Performance – Designed for both daily wear and outdoor adventures like skiing, trekking, hiking, walking, hunting, phishing and more daily activities. Breathable – Merino wool’s natural moisture-wicking ability keeps feet dry and comfortable no matter what the temperatures. Super Merino Wool Socks are easy to care for, so you can rest assured that your socks will survive the wear and tear of everyday life. For best results, simply turn them inside out, machine wash in cold water, gentle cycle. Do not use softeners, do not use bleach. Tumble dry on low or air dry better. Combining a super-comfortable anatomical fit with a warm and durable merino-blend fabric, our Super Merino Wool Socks are fully cushioned and designed for all-day performance.